MANILA, Philippines - State weather bureau announced that Tropical storm Nona (international name: Melor) continues to gain strength as it heads towards Samar-Bicol area based on 11:00am bulletin today, December 13, 2015. PAGASA raised public storm warning signal No. 1 (30-60kph expected in 36 hrs.) in 12 areas including Catanduanes, Camarines Sur, Albay, Sorsogon, Masbate including Burias and Ticao Islands, Northern Samar, Eastern Samar, Samar, Biliran, Leyte and Southern Leyte,Dinagat province. The weather bureau said that it is possible to raise PSWS #1 also over Camarines Norte, Southern Quezon, Marinduque and Romblon tonight. At 10:00 AM today, the center of 'Bagyong Nona' was estimated based on all available data at 565 km East of Catarman, Northern Samar (12.1°N, 129.8°E). 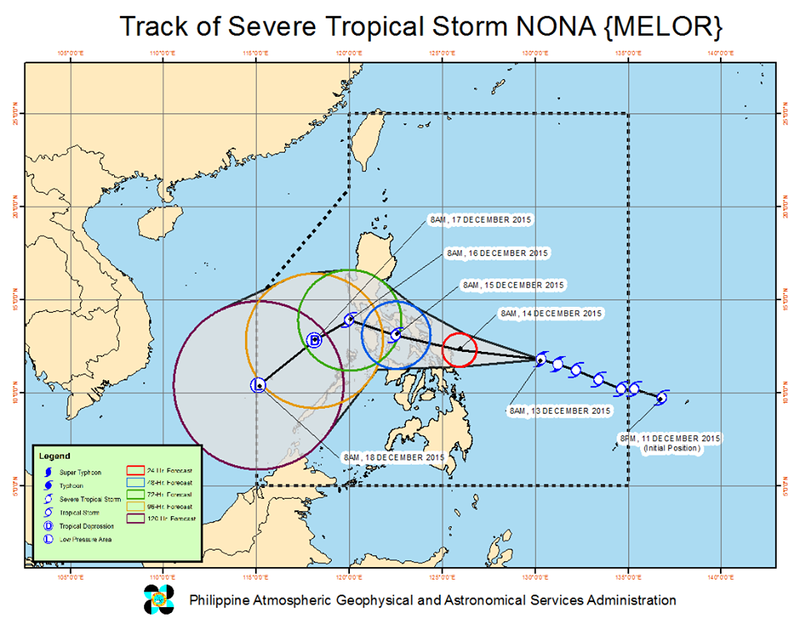 The several tropical storm has maximum sustained winds of 110 kph near the center and gustiness of up to 140 kph. It is forecast to move West Northwest at 19 kph. The public and the disaster risk reduction and management council concerned are advised to take appropriate actions and watch for the next Severe Weather Bulletin.